Almost simultaneously, the handful of companies that pipe the Internet into and out of Egypt went dark as protesters were gearing up for a fresh round of demonstrations calling for the end of President Hosni Mubarak’s nearly 30-year rule, experts said. 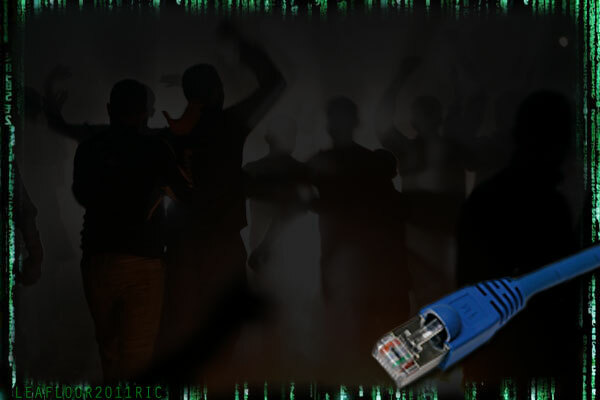 Experts say it’s unlikely that what’s happened in Egypt could happen in the United States because the U.S. has numerous Internet providers and ways of connecting to the Internet. Coordinating a simultaneous shutdown would be a massive undertaking. "It can’t happen here," said Jim Cowie, the chief technology officer and a co-founder of Renesys, a network security firm in Manchester, New Hampshire, that studies Internet disruptions. "How many people would you have to call to shut down the U.S. Internet? Hundreds, thousands maybe? 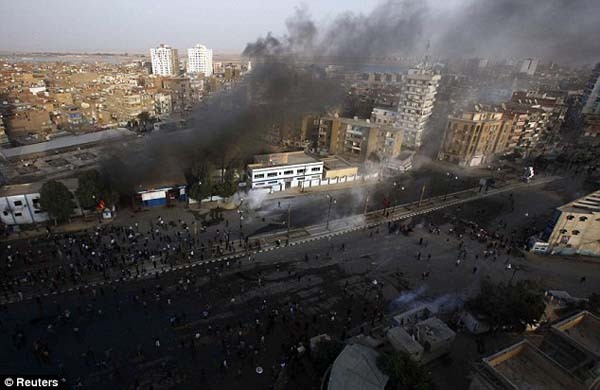 Smoke rises over Suez after protesters torched the fire station during clashes with police. We have enough Internet here that we can have our own Internet. If you cut it off, that leads to a philosophical question: Who got cut off from the Internet, us or the rest of the world?" In 2009, Iran disrupted Internet service to try to curb protests over disputed elections. And two years before that, Burma’s Internet was crippled when military leaders apparently took the drastic step of physically disconnecting primary communications links in major cities, a tactic that was foiled by activists armed with cellphones and satellite links. Computer experts say what sets Egypt’s action apart is that the entire country was disconnected in an apparently co-ordinated effort, and that all manner of devices are affected, from mobile phones to laptops. It seems, though, that satellite phones would not be affected. When countries are merely blocking certain sites — like Twitter or Facebook — where protesters are co-ordinating demonstrations, as apparently happened at first in Eqypt, protesters can use "proxy" computers to circumvent the government censors. The proxies "anonymize" traffic and bounce it to computers in other countries that send it along to the restricted sites. But when there’s no Internet at all, proxies can’t work and online communication grinds to a halt. Renesys’ network sensors showed that Egypt’s four primary Internet providers — Link Egypt, Vodafone/Raya, Telecom Egypt, Etisalat Misr — and all went dark at 12:34 a.m. Those companies shuttle all Internet traffic into and out of Egypt, though many people get their service through additional local providers with different names. "There’s no way around this with a proxy," Cowie said. "There is literally no route. It’s as if the entire country disappeared. You can tell I’m still kind of stunned." The technical act of turning off the Internet can be fairly straightforward. It likely requires only a simple change to the instructions for the companies’ networking equipment. Craig Labovitz, chief scientist for Arbor Networks, a Chelmsford, Massachusetts, security company, said that in countries such as Egypt — with a centralized government and a relatively small number of fiber-optic cables and other ways for the Internet to get piped in — the companies that own the technologies are typically under strict licenses from the government. "It’s probably a phone call that goes out to half a dozen folks who enter a line on a router configuration file and hit return," Labovitz said. "It’s like programming your TiVo — you have things that are set up and you delete one. It’s not high-level programming."